To celebrate the release of the limited-edition Rocky. The Complete Films, some 100 VIP guests gathered at TASCHEN Beverly Hills. Hosted by publisher Benedikt Taschen and famed sports photographer Neil Leifer, guests joined Sylvester Stallone to receive an exclusive first look at the book, which features hundreds of images from the making of the Rocky films – including many on-set photographs by Leifer – alongside material from the Academy Library and MGM archives. After sharing a few words detailing the process of making the book and expressing thanks, Mr. Taschen and Mr. Stallone – who was accompanied by his wife Jennifer and daughter Sophia – posed for photographs and talked with guests. The select crowd included Arnold Schwarzenegger, as well as Marlene and Charlotte Taschen. 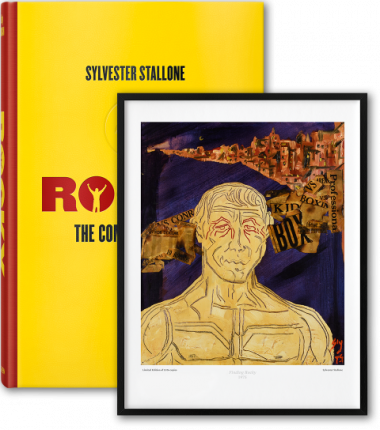 Each of the 2,000 signed copies is accompanied by a print of Mr. Stallone’s Finding Rocky (1975), a painting he completed before writing the script, and a facsimile of Mr. Stallone’s handwritten notebook for the first installment of the franchise (circa 1975), which describes dialogue, scenes, and ideas for Rocky, as well as the original unused ending.